The FLASHE range, distributed since 1955, is one of the first modern painting materials. Its optical characteristics allow the effects of old tempera paints and primitive painting grounds to be reproduced matt and velvety, opaque. FLASHE colours are water-based and can be diluted with water to produce watercolour/gouache wash effects. They become indelible when dry. FLASHE colours can be applied using brushes, air brushes, or sponges. FLASHE is a multi-purpose product with many uses: preparing grounds for use with oil or acrylic paints, canvas paintings, theatre sets, advertising, thumbnail sketches or trompe l'oeil drawings. For these many techniques, FLASHE has a palette of 77 colours (35 new colours since 2007) that can all be mixed together. FLASHE is available in 4 ounce (125ml) glass jars (77 colours). 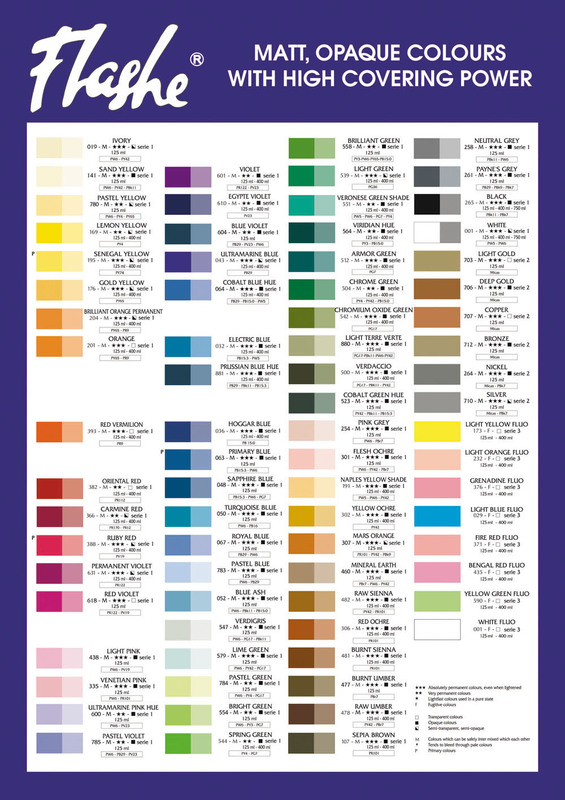 49 colours are also available for special order in 400ml glass jars. Black and White may also be special ordered in 750ml glass jars. Please inquire in store about the estimated wait-time for special order sizes. All colours (except for the fluorescent colours) are pigment based for good to excellent lightfastness.